The article gives a new data on the biology and fecundity of the grasshopper Damalacantha vacca (Fischer von Waldheim, 1846), a rare species of the Orthopterans, listed in the Red Book of the Republic of Kazakhstan. Earlier in the literature it was noted that this species eats saltwort (Salsola). When the Damalacantha vacca was kept in the cage, in addition to plant foods (except for Amaranthaceae and Chenopodiaceae plants, cereals, mostly spikelets and young leaves, and thinly sliced pieces of various vegetables - cabbage, potatoes, carrots) were eaten, and animals (dead grasshoppers, flies and butterflies - Owlet moths). Egg laying by females carried out in batches of 5-6 pieces per soil, with preference given to areas with compacted soil, permeated with interlaced plant roots. Fecundity of two females, who made a full clutch, was 49 and 54 eggs, respectively. For the first time the description of the egg is given and the structure of the chorion. Bei-Bienko, G.Ya. (1951). Studies on katydids (Orthoptera, Tettigoniidae) of the USSR and neighboring countries. Proceedings of the All-Union Entomological Society, 43, 127-170. (In Russian). Childebayev, M.K. (2006). Damalakanta Vacca - Damalacantha vacca. Red book of Almaty region of Kazakhstan. Animals, Almaty, 32-33. (In Russian). http://Orthoptera.SpeciesFile.org. Accessed on 20 December 2016. Chomgsozhav, L. (1972). Acridoidea and Tettigonoidea of the Mongolian People's Republic. Insects of Mongolia, 1, Leningrad, Science. (In Russian). Chomgsozhav, L. (1977). Orthopteroidea of the Gobi desert. Insects of Mongolia, 5, Leningrad, Science. (In Russian). Dmitrieva-Yurgenson, I.A. (1950). To the biology of the katydid Deracantha onos Pall. Entomological review, 31 (1-2), 157-164. (In Russian). Elaeva, N.F., Elaeva, N.A. (2010). The peculiarities of ecology and morphology of (Deracantha onos Pall., 1772) in the South-Western Transbaikalia. Bulletin of the Buryat University, 4, 166-170. (In Russian). Eversman, E. (1859). Orthoptera Volgo-Uralensia. Bull. Soc. Nat. Moscow, 32 (1) 121-146. Fischer von, Waldheim. (1846). Entomographia Imperii Rossici. IV. Orthoptera Imperii Rossici. Nouv. Mém. Soc. Imp. Natur, Moscow, 8 (I-IV), 1-443. Marikovsky, P.I. (1983). In the world of insects with a camera. Alma-Ata, Kainar. (In Russian). Nasyrova, S.P. (1999). Damalacantha vacca F.d.W., 1846. Red Book of Kazakhstan, 1. Animals, 2. Invertebrates. Edition 3, revised and enlarged, Almaty, 48-49. (In Russian). Nemkov, V.A. (2006). Materials to the Red Book of the Orenburg Region. Bulletin of the OSU, 5, 142-145. (In Russian). Pravdin, N.F. (1978). Ecological geography of insects of Central Asia. Orthopteroids. Moscow, Nauka. (In Russian). Pravdin, F.N., Mishchenko, L.L. (1980). Formation and evolution of ecological fauna of insects in Central Asia. Moscow, Nauka. (In Russian). Fedorov, S.M. (1962). To the biology of katydids Bradyporus multituberculatus F.-W. and Onconotus laxmanni Pall. (Orthoptera, Tettigonoidea) in the steppes of Ciscaucasia. Entomological review, 41 (4) 751-762. (In Russian). Sergeev, M.G., Bugrov, A.G. (1988). Grasshoppers of the subfamily Deracanthinae (Orthoptera, Bradyporidae) of Siberian fauna. Taxonomy of Siberian animals. Novosibirsk, SB Nauka, 46-53. (In Russian). Toms, S.V. (1990). Thermal regulation by evaporation of water gies in Colias butterflies: thermal stress and the limits to in Damalacantha vacca sinica (Orthoptera, Tettigonidea) adaptation in temporally varying environments. Entomology review, 70, 39-48. Thoms, S.V. (1991). Evaporation of water as a method of thermoregulation in a desert katydid Damalacantha vacca sinica (Orthoptera, Tettigonioidea). 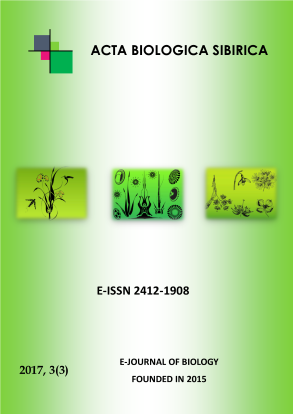 Zoological journal, 70 (2) 30-39. (In Russian). Yakobson, G.G. (1905). Orthopterans. Orthoptera. In: Yakobson, G.G., Bianki, V.L. Orthopteroid and Pseudoneuropteroid Insects of Russian Empire and adjacent countries. St. Petersburg, Publication A.F. Devriena. (In Russian).